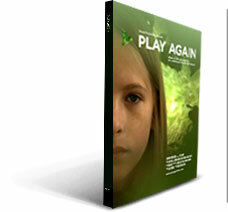 DOCUMENTARY Play Again: What are the consequences of a child removed from nature? This is an amazing documentary about children who are “wired in” for seriously long periods of time a day. Hundreds of texts every day, hours in front of the computer screen, gaming, on-line chats. For some of them, the computeer is their social life. Chidlren who have difficulty connecting to other children socially may also fall prey to this easy way of what feels like connecting to others. Humans have an innate need to connect to other people. Their survival and well-being depends on it. For children who may be on the margins (obese, socially inept, shy), the world of computers leaves their deficits and the reality of social interactions behind. If you get a chance to view this documentary I would highly recommend it. It can also be purchased for a reasonable price and you and parents in your social circle could view it together and have a discussion. “One generation from now most people in the U.S. will have spent more time in the virtual world than in nature. New media technologies have improved our lives in countless ways. Information now appears with a click. Overseas friends are part of our daily lives. And even grandma loves Wii. Through the voices of children and leading experts including journalist Richard Louv, sociologist Juliet Schor, environmental writer Bill McKibben, educators Diane Levin and Nancy Carlsson-Paige, neuroscientist Gary Small, parks advocate Charles Jordan, and geneticist David Suzuki, PLAY AGAIN investigates the consequences of a childhood removed from nature and encourages action for a sustainable future. Seventy years ago, the first televisions became commercially available. The first desktop computers went on sale 30 years ago, and the first cell phones a mere 15 years ago. During their relatively short tenure these three technologies have changed the way we live. Some of these changes are good. Television can now rapidly disseminate vital information. Computers turned that flow of information into a two-way street. Cell phones enable unprecedented connectivity with our fellow human beings. And the merging of cell phones and the internet has even allowed protest movements around the world to organize and thrive. But there’s also a down side. For many people, especially children, screens have become the de facto medium by which the greater world is experienced. A virtual world of digitally transmitted pictures, voices, and scenarios has become more real to this generation than the world of sun, water, air, and living organisms, including fellow humans. The average American child now spends over eight hours in front of a screen each day. She emails, texts, and updates her status incessantly. He can name hundreds of corporate logos, but less than ten native plants. She aspires to have hundreds of online friends, most she may never meet in person. He masters complicated situations presented in game after game, but often avoids simple person-to-person conversation. They are almost entirely out of contact with the world that, over millions of years of evolution, shaped human beings — the natural world. The long-term consequences of this experiment on human development remain to be seen, but the stakes couldn’t be higher. By most accounts, this generation will face multiple crises — environmental, economic and social. Will this screen world — and its bevy of virtual experiences — have adequately prepared these “digital natives” to address the problems they’ll face, problems on whose resolution their own survival may depend? This shows real exisetpre. Thanks for the answer.